Justice Philip Louis Ulric Cross, is one of the most decorated West Indian Squadron leaders of World War II. At 24, Cross joined the Royal Air Force (RAF) in 1941. In June 1944 he was awarded the Distinguished Flying Cross and in January 1945 he was awarded the Distinguished Service Order in recognition of his excellence in the RAF. After WWII, Cross went on to study law, he was called to the Bar in 1949 ( Middle Temple, London). He spent some 16 years in Africa practicing law where he was elevated to Senior Crown Counsel and Attorney General in West Cameroon. In 1967 he became a High Court judge in Tanzania and also served as a Professor of Law at the University of Dar- es- Salaam before returning to Trinidad in 1971 as a Judge in the High Court. In 1979 he served as Judge of the Court of Appeal. 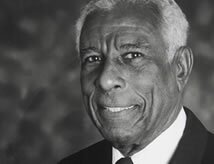 From 1982-83 he served as chairman of the Law Reform Commission of T&T. He remains a Consultant with Trinity Chambers and has presided over a number of arbitrations since his retirement from the Bench. He is a founding member of the Cotton Tree Foundation having worked very closely with the late Desmond Allum . He is also a Board member of the Cropper Foundation.